There is truth to the saying that every season, the rinks get smaller. Players get bigger and smarter at taking away time and space. 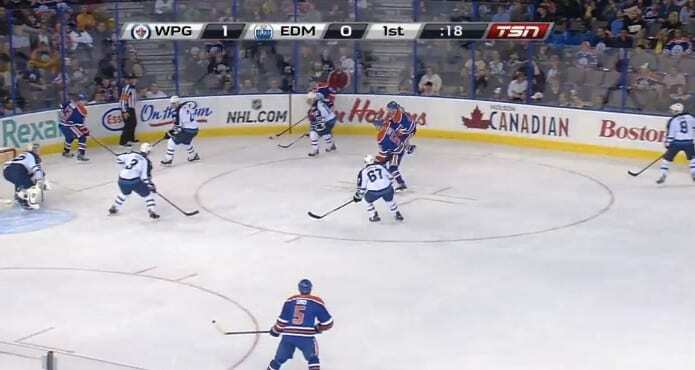 It’s no doubt that a winger often finds themselves late getting to the puck, or trapped on the half wall. With increased effort on anticipation and proactivity, a winger can add more seconds to the clock and more centimeters of space on the ice. 1. Shift in puck Possession: Being proactive about the moment when a teammate is successful at regaining possession of the puck in the D zone is probably the single most important non-puck related skill a winger can develop. It allows the winger to seemingly control time as if by a sixth sense ability because they will always be one step ahead of the play, getting a jump on being a passing option for the breakout. It truly is the difference between getting deep enough to support the defenseman properly and staying composed enough to do the right thing with the puck once it is passed (Eg. Making a well-placed outlet pass to the supporting centerman). It’s also the best way to avoid becoming a piece of board advertising by a pinching defenseman. 2. Reverse of Flow to Weak Side: In an ideal world, a puck carrying defenseman can wheel past the first forechecker in enough time to make an excellent tape to tape pass to a winger waiting patiently on the wall. This isn’t always possible under a relentless set of forecheckers so the D may have to make a tight turn back the opposite way to evade F1 or make a quick D to D pass to relieve the pressure to the weak side. In this case, it is important to be able to read the pressure and the defenseman’s body position (position of the toe caps of the skates etc) to get a head start on helping the centerman to support the far winger in the case of an overload or driving hard into the neutral zone in the case of a stretch play. This type of decision without the puck from a weak side winger is often the starting point to successful offense in the far end of the ice. 3. Whether the offensive D is about to Pinch: If the winger can get their head on enough of a swivel to read the opposing defenceman’s body language just before receiving the breakout pass, they will be better prepared to chip the puck past him or move it quicker to the swinging centerman. Of course the centerman should be an extra set of eyes to call the info out to the winger, but getting into a support pocket early enough means more time to check and see what threats are coming down the half wall. 4. When it’s time to collapse to the front of the net: being able to read ahead into a situation where the defenseman covering the front of the net is about to be outnumbered can be the difference between getting to the front of the net to lift a stick in time and save a goal, or graciously letting the other team go ahead by a goal or two. A winger on the week side should constantly be scanning for potential threats and be able to get on their toes to explode low in an instant. Very impressive to anyone in the stands with a clipboard and a checklist for sure. 5. Opposing Defenseman Driving the Net: Coaches say head on a swivel so much that it has almost become cliché now a days, but when it comes to being puck-focused and missing the back door drive of a hungry D, coaches can’t seem to say it enough. One of the hardest parts about being a winger is the dual awareness of where the puck is as well as the opposing defenseman. Keeping the feet moving while covering the point and being able to read the foot work of the D is what allows a winger get on their toes stay under their stick all the way to the crease. Generally, if they are on their inside edges, they aren’t ready to move, but as soon as they turn their hips even slightly to either boards, they are about to explode forward. We are very excited to have Jim Vitale of Vital Hockey Skills as a guest blogger for TheCoachesSite. Jim attended our inaugural TeamSnap Hockey Coaches Conference and has a lot of great insight into the game. He is a great asset for our readers and anyone looking for training in the Greater Toronto area. 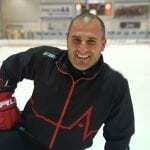 Jim Vitale is a coach in the Greater Toronto Area and Owner of Vital Hockey Skills (www.vitalhockeyskills.com). His passion stems from the application of principles of Physiology and Biomechanics to all areas of hockey skill development. Jim is a seasoned coach and has in-depth knowledge of systems as they pertain to team tactical play.